Which South American country has the highest cable car system in the world? In which English county is the town ‘Cerne Abbas’, famous for its chalk giant? The brain in a vat theory is an element used in a variety of thought experiments intended to draw out certain features of our ideas of knowledge, reality, truth, mind, and meaning. It is drawn from the idea, common to many science fiction stories, that a mad scientist might remove a person’s brain from the body, suspend it in a vat of life-sustaining liquid, and connect its neurons by wires to a supercomputer which would provide it with electrical impulses identical to those the brain normally receives. 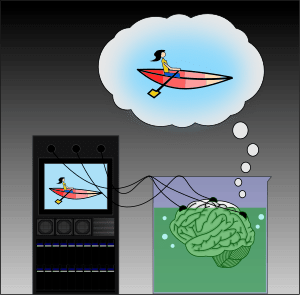 According to such stories, the computer would then be simulating reality (including appropriate responses to the brain’s own output) and the person with the “disembodied” brain would continue to have perfectly normal conscious experiences without these being related to objects or events in the real world. The simplest use of brain-in-a-vat scenarios is as an argument for philosophical scepticism and Solipsism. A simple version of this runs as follows: Since the brain in a vat gives and receives the exact same impulses as it would if it were in a skull, and since these are its only way of interacting with its environment, then it is not possible to tell, from the perspective of that brain, whether it is in a skull or a vat. Yet in the first case most of the person’s beliefs may be true (if he believes, say, that he is walking down the street, or eating ice-cream); in the latter case they are false. Since, the argument says, you cannot know whether you are a brain in a vat, then you cannot know whether most of your beliefs might be completely false. Since, in principle, it is impossible to rule out your being a brain in a vat, you cannot have good grounds for believing any of the things you believe; you certainly cannot know them. A sceptical hypothesis is a hypothetical situation which can be used in an argument for scepticism about a particular claim or class of claims. Usually the hypothesis posits the existence of a deceptive power that deceives our senses and undermines the justification of knowledge otherwise accepted as justified. Sceptical hypotheses have received much attention in modern Western philosophy. Some of the prominent sceptical hypotheses in Western philosophy include: evil dæmon, brain in a vat, and the five minute hypothesis.